Create a classic gunshot wound in a few short minutes. 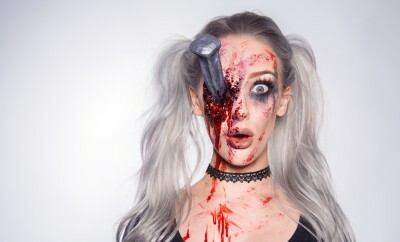 This halloween makeup is very easy to create and can be applied anywhere on your body. Why... why am I watching this? I have stuff to do. What the.............. and what are u thinking! Can I use latex for this? you probably could. like take a cotton ball and satiate it in latex and make a ring with it then do the other stuff. but it probably wouldn't look as real as it woukld if you use the wax. What's the wax you use called? I no that 🤗🤗. I mean the manufacturer. What type of wax is that? What brand blood? Or name? Can't seem to find online. Lmao, i laughed too hard at this comment! love these quick vids hope there will be more on the way. Glad you like them! We'll push out lots more of these quickies during the next two months, along with a few really advanced makeups as well.